Did I finish? : I did, I savored this book! One-sentence summary: Fifteen stories about a young woman, an aspiring artist, who struggles to find her place in the world. Do I like the cover? : I do, it is reminiscent of a line from midway in the book, an inside joke between characters that we readers are a part of. First line: I was worried my heart would crack and reveal me, the way Baba's treasured pysanka had done., from 'Smuggling a Boy into Baba's'. Buy, Borrow, or Avoid? : Borrow or buy if you like coming-of-age-ish fiction, smart stories about young women finding their footing, and place as character. Why did I get this book? : When I read in the marketing material that this collection was "Stories for Anyone Who Couldn’t Relate to Holden Caulfield" -- that's me to a 'T'! Review: As soon as I saw this promoted as 'stories for anyone who couldn't relate to Holden Caulfield', I was sold -- The Catcher in the Rye is a very strong least favorite of mine. I love coming-of-age stories and Wirstiuk's collection of vignettes immediately grabbed me as I just was smitten with our unlikely heroine. Veda, from a Ukrainian family in New Jersey, is an aspiring artist. She's self-absorbed, sad, moody, friendly, uneasy, lovely. Veda is the kind of friend I would have liked to have in college, as new to sophisticated life as I was, plunging headlong into what we perceived, for good and for bad, as proper grown up life. She fumbles through relationships with men -- 'Not Homecoming', the story on her attempt to lose her virginity, was hilarious and heartbreaking, and all too awkwardly familiar -- and works to be satisfied with her looks while being deeply insecure about them. Wirstiuk tells the story through Veda's eyes, and the narrative is a mix of selfish ruminations and poetic moments (like ...the skyline showed some of itself between buildings like a woman performing a striptease (p76)); I laughed and cringed in equal part. 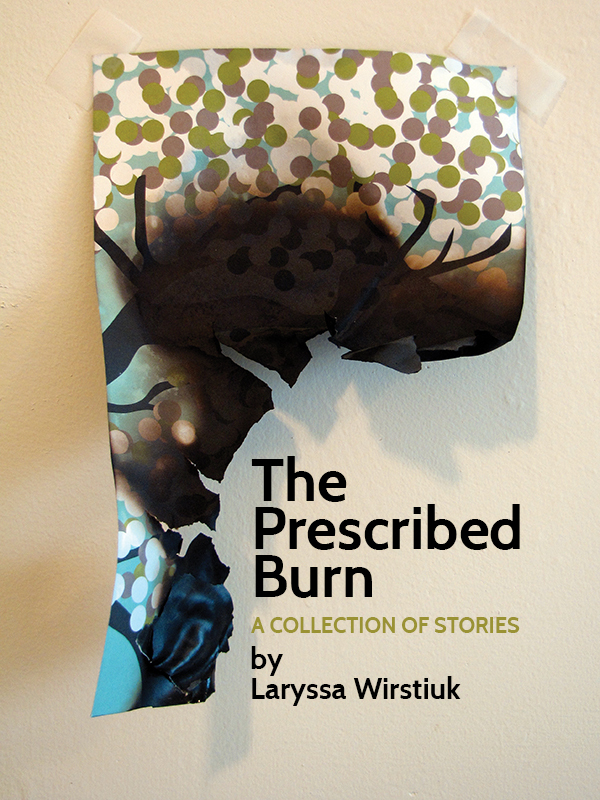 You can download a sample story for Wirstiuk's website to get a taste of her writing style. She -- and her Veda -- were the anchor to this collection and the reason for reading, and I loved how flawed and real Veda was. The book itself is as much a treat as the stories; the collection opens with a series of captioned photographs, one for each short story, as if Veda were presenting this as an art project of her own. There are discussion questions, creative writing exercises, and Veda's Guide to a Creative Life, treats that extended my time with this book and Veda. Wirstiuk ran a Kickstarter campaign to raise funds to print this volume, and donors were able to fund a final short story by providing a word or phrase. I was dubious, but Wirstiuk made it work. A fabulously engrossing debut, and worth splurging on -- e-book or otherwise -- as Veda stuck with me, and I'm missing her like I do a far-away friend. I'm thrilled to offer a copy of The Prescribed Burn to one lucky reader! To enter, fill out this form. Open to US/Canadian readers, ends 12/14. That author name is a mouthful. Oh man, I am so with you on Holden Caulfield. We had to read it for my young adult resources course in grad school and I did not like it AT ALL. I thought Holden was whiny and stupid. No thanks. Then one of my friends said that Holden reminded her of me. Gee, thanks. Sadly, I'm generally unwilling to go to the trouble of getting my hands on small press books, because I know I won't be able to get them from the local library, and I don't want to buy a book I'm not certain I'll love for more than a couple bucks, which would be doable except that I don't like to buy ebooks at all, as we once discussed on GR. I feel you on the Holden hate and the small press purchasing quandary. This to me is a great e-book splurge which won't work for you, alas. If you get the short story sample download and like it, I encourage you to holiday wishlist it! I just really loved seeing that self-focus on a young woman -- unvarnished, selfish and selfless -- who was kicking around New York City and finding herself and making out with guys, etc. That marketing line would have totally worked on me, too. I'm intrigued, I may have to pick this up. totally worth it -- great mood and setting and a wonderful main character! Thank goodness someone else finds Cather in the Rye utterly unappealing. I think I might be in the right mindframe for these stories and will be adding to my TBR! I wish I could do a giveaway -- I might try after the New Year when I've got more cash -- because this one needs to be put into peoples' hands! I'm pretty bad about getting my hands on books from small presses, too, but I think you may well have persuaded me to give this one a try. Great review! Yaaay -- this one is so worth it! Such a delight to read! As I think Holden Caulfield was a whiny self absorbed doofus, I am drawn to this book, and would love to experience it. It sounds really artistically constructed, and like something that would hold my interest as I reflected back to those younger years. Excellent and very persuasive review today, Audra. You have a knack for making all the books you read sound like hidden gems, and I know when I come over here I am going to find something that I won't have seen anywhere else. It makes me SO happy to find so many folks who don't love TCITR -- I'm no longer alone!!! ;) Thanks so much for your kind words -- I know I'm pretty swoon-y in most of my reviews and I'm glad I can convey something of substance in them! This is a small press treat that is worth the splurge -- not just for the chance to connect with a younger self but also because of the inventiveness of the whole volume. Super fun! S/he hasn't noticed yet?! I'm relieved because I'm a big wimp about haters! You already had me at Holden Caulfield! I think this sounds great. Sounds great- I love hte Michael Alenykov comparison!